Fred is a very cute, black dog but his bedtime avoidance tactics mirror those of children everywhere. His story is definitely one that children and parents can relate to! 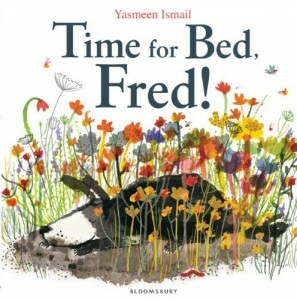 The Story: It’s eight o’clock and time for Fred to go to bed but he escapes into the garden. He gets so dirty that he needs to have a bath. After his bath he goes back into the garden and tries to hide from his owner. He ‘asks’ for a story then tries sleeping in various places before getting into his own bed. Fred is a very energetic, playful dog whose mischievous antics will endear him to young readers and are very familiar to parents! Falling out of a tree, landing in a muddy puddle and shaking himself all over the dry washing make my daughter laugh and I love the picture of him hiding in a watering can. Worn out by all the activity he does eventually fall asleep in his own bed (but not before he’s tried sleeping in the narrator’s bed!). Time for Bed, Fred! is narrated by an unseen character but the simple, childlike language (and the bed at the end of the story) indicate that the narrator is a child. With less than 150 words it is a great story for toddlers but also good for beginner readers as the sentences are short and repetitive. It perfectly captures the mischievous nature of a young dog, it would be a great book to buy for a child who is getting a new puppy. The illustrations in Time for Bed, Fred! are beautiful splashes of colour on a predominately white background. Most of the pages are double spreads, I love the one where he is standing next to a flowerbed and shaking water all over the clean washing. Smaller pictures show him mischievously trying to hide or sleep in various different places and exploring in the garden. There are lots of lovely little details in the illustrations, I love the wallpaper above the child’s bed and the expression on Fred’s face when he is in the bath. Time for Bed, Fred! is on the longlist for the 2014 Kate Greenaway medal. It’s the perfect bedtime story for little procrastinators! It sounds like this book was written especially for you! I just visited your blog and saw Fred’s picture – he’s cute 🙂 Thank you for visiting Story Snug. I would definitely recommend keeping hold of simple, familiar picture books as first readers. It increases a beginner reader’s confidence when s/he can ‘read’ familiar books alone. We still have all our ‘That’s Not My…..’ books for this reason! I have two bedtime procrastinators and my Mum has a mischievous little dog. Sounds like I’ve found a good book for them to read to me before lights out! Love picture books. This one looks like one I need to get. Thanks for sharing on the Kid Lit Blog Hop. 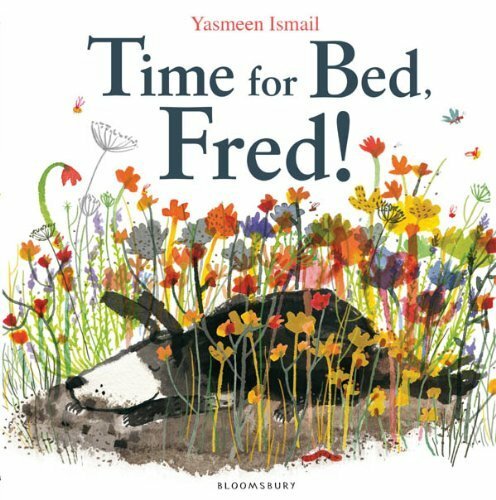 We LOVE Time for Bed Fred in our house – got it out from the library and had to renew it 3 times. Great choice. Just discovered your blog via the Britmums carnival and I’ll definitely be back!